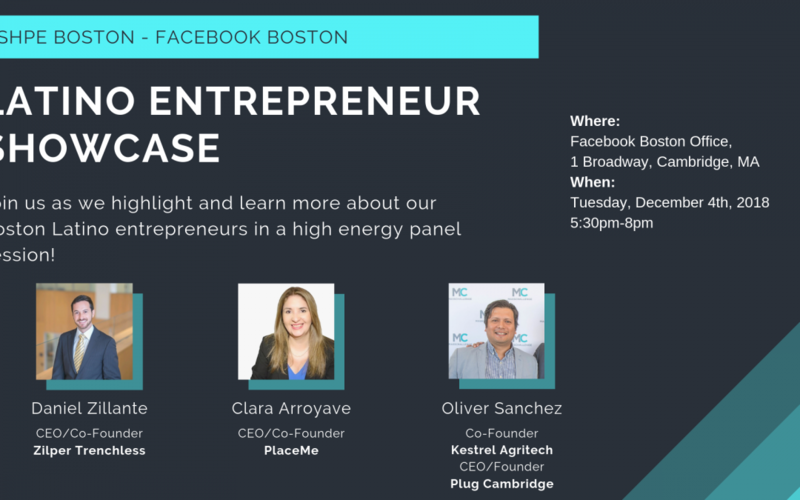 Join SHPE Boston and Facebook Boston as we highlight and learn more about our Boston Latino entrepreneurs! This panel event is open to everyone! – members, non-members, hispanics, non-hispanics, engineers and non-engineers. Zilper Trenchless is a construction tech startup that specializes in creating cost-efficient equipment for infrastructure projects, starting with underground piping projects. Our vision is to reduce the cost of infrastructure projects by using the latest technologies in what we consider a very traditional industry. Zilper Trenchless’ lead product is a machine which uses a novel proprietary technology to install or replace pipes underground without needing to dig a trench. The company has already built and tested a first prototype (MVP) in a real project, achieving outstanding results that sparked the attention of potential clients, manufacturers, and other competing companies. In May 2018, Zilper Trenchless won in the MIT 100K “Launch” Competition (Audience Choice Award). PlaceMe provides living-as-a-service solutions for the global young professional. PlaceMe simplifies moving to big cities and the cost associated with them, (starting with the Boston Market) by offering fully equipped bedrooms in apartments located in the most sought-after areas, at a flat monthly rent with flexible lease terms. PlaceMe eliminate the need for dealing with brokers, long-term contracts, finding roommates, moving and furniture expenses, so our customers have a hassle-free move. Members enjoy a complete turnkey and experience, with our fully furnished and equipped rooms and apartments, for mid and long term leases. All inclusive, flexible living, mobile payments, same market prices. Kestrel Agritech developed an automated pest protection suite that conducts active drone surveillance and leverages our proprietary intelligent recognition algorithms to deliver unparalleled pest detection and control. We’re now able to deploy timely and targeted countermeasures, thus minimizing crop loss. Kestrel Agritech is a finalist at MassChallenge 2018. Plug Cambridge is a boutique coworking innovation space, providing office solutions and startup related services focused on immigrant and early stage founders in the Latino community.